Transparent Records Management and other facets of ECM software provide the tools for better HR practices, even in an organization without a dedicated records manager. 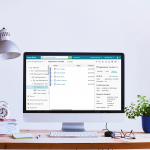 In Part 1 of this blog series, we described why HR records management is so challenging, then introduced Transparent Records Management as a solution. Here is a four-step guide to how this solution can be implemented in HR. The “records management” view of an HR repository only needs to be seen by one individual—the rest of the department can and should work within the “regular” view. Therefore, it is crucial to establish one HR professional who will use and maintain the “records management” view of the repository. This person will behave as an HR administrator who can access and make changes to documents in both views. Once an HR administrator is designated, that person can begin configuring the “Electronic records management” view of the repository. To determine what this repository should look like, the HR administrator must consider all the state and federal rules that apply to employee records. The administrator should also be aware of the security that must be applied to these records. For example, a senior-level HR professional might be allowed to see the dates of birth of employees while other HR professionals cannot. The HR administrator should establish access rights, redaction settings and other controls over the HR repository so that the privacy of employee records is not compromised. This security will be reflected in the “regular” view as HR professionals won’t have the same access rights as the HR administrator. With security and compliance in mind, the HR administrator can create folders and metadata templates within the “records management” view. Templates help categorize documents within the repository and also allow the ECM system to perform HR tasks automatically. How exactly? Keep reading. 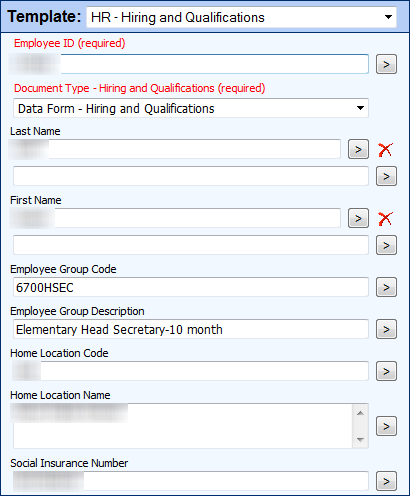 Example of an HR template with metadata fields. 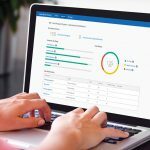 Having multiple views of the same repository is just one advantage of ECM and transparent records management—HR departments can also use the software to automate tasks. For instance, onboarding a new employee creates a lot of documents that must be classified, filed and given a records retention schedule. The HR professional in charge of adding these new documents to the HR repository can use a template to assign the appropriate metadata to each document. Once this metadata is applied to a document, the ECM system automatically moves the document to the correct record folder in the HR repository. The HR administrator can immediately view this document in the “records management” view of the repository while other HR professionals can see a shortcut to this document in the “regular” view. Automation also relieves the HR administrator from having to assign records retention schedules to each document. The HR professionals assigning templates only have to know what type of document they’re looking at and the ECM system handles the rest. As new employee documents enter the HR repository, they are automatically assigned retention schedules based on document type. For example, employers are required to keep all employment tax records for at least four years after filing for the fourth quarter of the year. Classifying a document as an employee tax record tells the ECM system how long that document must be kept. To maximize HR efficiency, the ECM system can send automatic email notifications whenever a record is ready for disposition. This ensures consistent and compliant record keeping without making records management a full time job for the HR administrator. With ECM and transparent records management, HR departments can easily and securely manage employee records. But ECM allows for even more than efficient record keeping: see all the ways it improves HR efficiency in the free eBook.